Last year, about this time, I received a phone call from a friend wanting to know if we wanted some ducklings. Without even thinking I blurted out, yes! Then realized it would probably be better if I asked my husband, Steve first before I commit us to this new endeavor. Steve and I had already discussed adding ducks to our growing farm. It was something that we wanted to do, but we needed to build a floating duck house (Be sure and watch our video on building a floating duck house), and find a good place for them to grow before going to our pond. Steve reminded me of all this, and I reminded him that we got chickens before we had a chicken coop. We tend to do things like that. We always put our cart before the horse. If we waited until we were ready, nothing would happen! So Steve agreed, with reservations of course, and I excitedly once again told my friend, yes! She didn’t know how many there would be. Anywhere from 2-7, but she would let us know when they were ready. So excitedly we went about the rest of the evening planning and dreaming, anxious to get started on our new adventure. Then time past, and we didn’t get any ducks. And so we waited. Still no ducks. And we waited some more. And still no ducks. We actually thought that we weren’t going to get them. We kept asking and wondering. The kids kept asking and wanting to know when the ducks were coming. We even went to pick them up one night from my friend’s house, but they hadn’t been delivered. Things were looking pretty grim about actually getting any ducks and Steve and I had pretty much decided that it was probably for the best. Then at what I thought was the worst possible time (one week after I had major surgery), we got our ducklings. They were absolutely adorable! We ended up getting 4 ducks and we immediately fell in love. I realized that the timing was perfect. With me unable to do anything but look at them (and even then it was only for a few seconds) the kids HAD to pitch in and do their share to take care of the ducks. Of course Steve had a big hand in the ducks’ welfare and I am so grateful! When Steve had to go back to work, but I still wasn’t able to take care of myself, let alone anything else, my parents would come over and my dad took care of those little ducklings. I think he enjoyed it! Or at least if he didn’t, he sure didn’t complain. After having them for almost a year, there have been a few things that we have learned. 1. Ducks are extremely messy and smelly! I really had no idea how messy they are until we got them. They love to splash in the water! And not just puddles or ponds. They like to splash in their drinking water. They also mix the water and food together and then it gets everywhere. If you have to keep them inside (we did until it warmed up and they were older), then I must warn you about the smell. We had to clean out their little home twice a day. It was almost impossible to keep it clean! We don’t have a garage, so inside the house was where they stayed. If you have a garage, that would be much better! 2. Ducks are surprisingly resilient. We almost killed one of our ducks unknowingly. We thought it would be a great idea to fill up a little tub and let them swim. What we didn’t think about was that they water, straight from our well was icy cold. One little duck, the runt of the bunch, got too cold and almost died. It because lifeless and I grabbed a towel and wrapped it up and gently rubbed it. It started to revive, but I knew it needed more warmth. So I heated up one of our rice bags and put the bag under the towel that I had the duck wrapped in. It survived, thank goodness! Then another duck got trampled by the others while they were outside. It was unintentional, but we thought this little duck was a goner for sure. We separated it and took special care of it. It took a couple of days, but was soon well again and able to function. 3. Ducks make great watch dogs. I remember when we got our guineas my mom warned me that they would be loud. Well, it wasn’t the guineas that were loud, but the ducks! Not all the time mind you, just when something was going on that shouldn’t be. Their quacks were definitely loud enough for us to hear inside the house, and we always knew that when we heard them, we needed to check on them. They are great watch dogs! 4. Ducks love to eat dog food! We do not intentionally feed our ducks dog food. Our ducks, chickens and guineas roam free in our yard. So if the dogs have not eaten all their food from the night before (we have to feed them at night when the animals are all put up so they actually get to eat!) then the ducks go straight to the food and finish it off for them! Our poor dogs, they don’t quite know what to do. They know better than to hurt the ducks, they have been trained. So they just lay there and watch them eat. Poor Lynn and Abby, the ducks eat all their food. 5. Duck eggs are delicious! Duck eggs are a bonus! They are extremely delicious, very rich and creamy, are great in baking. They have 9 grams of protein compared to 6 grams that a chicken egg has. They are also higher in Omega-3 fatty acids, and people who are allergic to chicken eggs, generally are able to tolerate duck eggs. Also depending on the breed of duck you have, they can lay year-round. Our ducks laid this past winter while our chickens did not. This allowed us to continue having eggs without having to buy any! 6. Ducks live well with chickens and guineas. 7. Ducks will always come home at night. When we first started taking the ducks to the pond, we thought we would have to go and get them to bring them back to the coop to keep them safe. We were shocked when on the first night as we walked out the back door to heard them back to safety, they already beat us to it. They had spent the day on the pond, enjoying the water and all the luscious berries, and grasses and bugs to eat. But as the sun started to go down, they made their way back to their home for the night. Every night since then, no matter where they might be in the yard, or even the field, when the sun starts to go down, they come home. We lost one of our ducks. I’m not sure what happened to it, although we can all guess that it probably ended up as a scrumptious dinner for either a coyote or fox (we have both). We had lost chickens and guineas before like that, but it never bothered me knowing that is part of farm life. It bothered me losing a duck. I think of them more as pets than as a farm animals. This spring we have a chance to get more ducks and we have jumped at the chance! We love our ducks and are looking forward to getting more to add to our family. 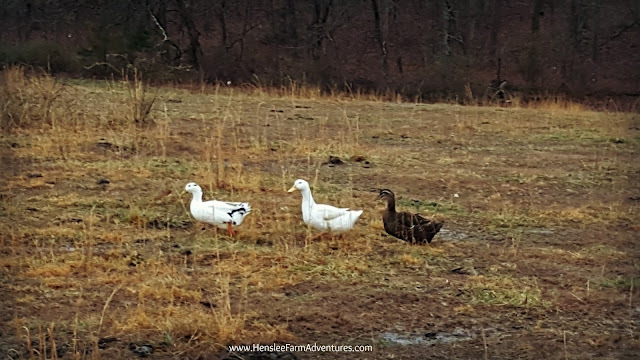 Are you wondering about adding ducks to your farm? I would definitely say it is worth it. 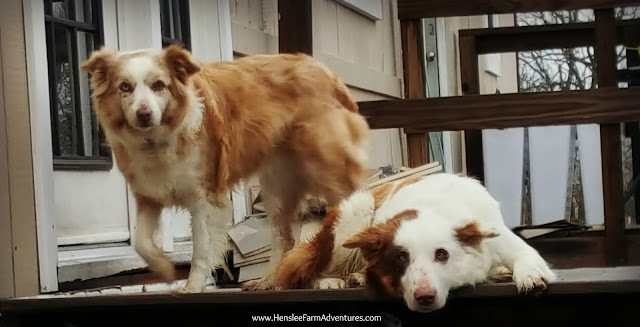 They are wonderful animals and even though they are a little work, they make our farm and our family a happier place. Let me know in the comments below how you feel about ducks.